originally had a white vinyl top, opera windows, and body side moldings. over the opera windows, and re-painted the car with the stripe. The conversion took him two years, but he says it was well worth it! Mike says people "really get a kick" out of seeing his car! Created September 11, 2002. All Rights Reserved. 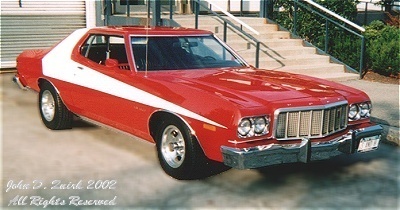 "Ford Gran Torino" is a Trademark of Ford Motor Company.